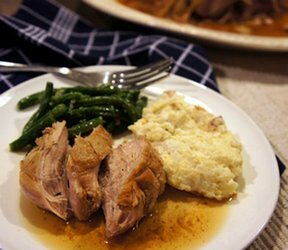 Place the pork roast in the bottom of the slow cooker. Pour the chicken broth over the roast. Sprinkle the Lipton Onion Soup Mix over the top of the roast. Place the onion slices on top of the meat and cover the slow cooker. Allow it to cook for 7 to 8 hours on low or cook for 1st hour on high and then turn down to low and cook for 5 to 6 more hours. Remove from slow cooker and trim excess fat. Drain juice from the slow cooker but do not discard. 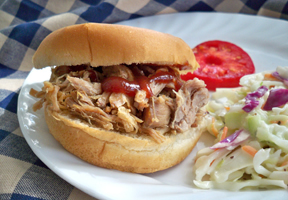 Pull the pork into shredded pieces and place back into the slow cooker. 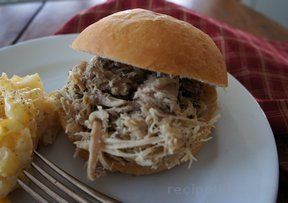 After all the pork has been placed back in the slow cooker, pour some of the juice back in over the pork to help keep it moist. Add just enough to moisten the meat. Do not have more than 1/4 inch of juice sitting on the bottom. Cover and reheat; serve on buns with favorite toppings. "We have done ours with the same type of roast but only added 2 cans of rootbeer, and slow cooked it for 8 hours, the best that we have ever had"
"So easy and so good. I made these pulled pork sandwiches for my dad's 60th birthday party and everyone thought they were great. They ate them all up!"